This brush contains more than one million very fine carbon fiber bristles. The cross section of these bristles is so small that they can easily get into all the nooks and crannies of the record groove. Because the carbon fiber conducts electricity it takes away all the static to earth via the metal handle and the person holding the brush. Then the dust lies loose in the groove so the next set of bristles can easily pick them up and remove them from the record groove. 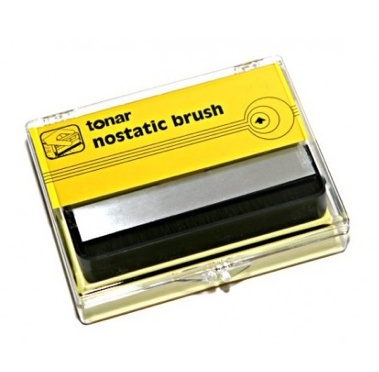 Tonar Nostatic Brush has two rows of over a million micro fiber bristles to brush away dust, dirt, and static. The holder has a wedge for cleaning both rows of bristles after use.